The 30-Doodles-in-30-Days Challenge is drawing to a close, but one thing I have discovered is that everyone has enjoyed having a daily doodling suggestion (a “prompt”) as a creative springboard. And seeing each other’s responses to the prompt sparks additional creative ideas and a sense of community. Several doodlers have joined our ranks in just the past couple of days, even though the 30-day challenge is nearly over. There seems to be quite a bit of interest in continuing with the daily prompts and our Facebook group. Before I can turn the daily prompt into an ongoing activity, I have a few technical problems to resolve, but we’ve had such a good time, and it’s been so helpful to everyone to have the sense of community and interaction, that I want to open up the daily doodling prompts and the Facebook community to others of you who might not have wanted to commit to creating every single day, but might still find the creative prompts and/or the closed Facebook group enjoyable. Next week, as the 30-day challenge ends, I’ll be able to tell you more about how the doodling group is evolving, but for now, I thought I’d give you a prompt to play with in the meantime. Since I’ve been on a spiral kick myself lately, I invite you to create a “doodle” (or doodles) based on a spiral or spirals. Judging from what I see from fellow artists, and comments on my own work, a lot of us are fond of spirals. At least part of this is probably because of the many spirals found in nature. The sense of movement a spiral conveys is also part of its appeal. Gazing at a spiral can give you a sense of being drawn downward, to a place of peace and contemplation, or inward to an interior space of memory or self-exploration. Or a spiral can give a sense of outflowing energy and expansiveness. One of my 30-paintings-in-30-days pieces. I’m working on several others featuring spirals. Simply drawing a spiral is soothing. Our joints naturally move in arcs, so the circularity of a spiral feels natural and effortless, while the inward or outward movement gives the motion interest and variation. Spirals are easy to connect to arcs and to each other, to decorate a design or create a texture. Ink doodle or crow decorated with spirals. How does it make you feel to gaze at a spiral? Or draw one? Is it like a dance? Are you going down the drain? Or being flung exuberantly out to the stars? What images, thoughts or memories do spirals call up for you? Do they have special associations or meanings for you? Does it make a difference which way the spiral turns? Whether you start in the center or on the outside, or spiral in, and then back out? 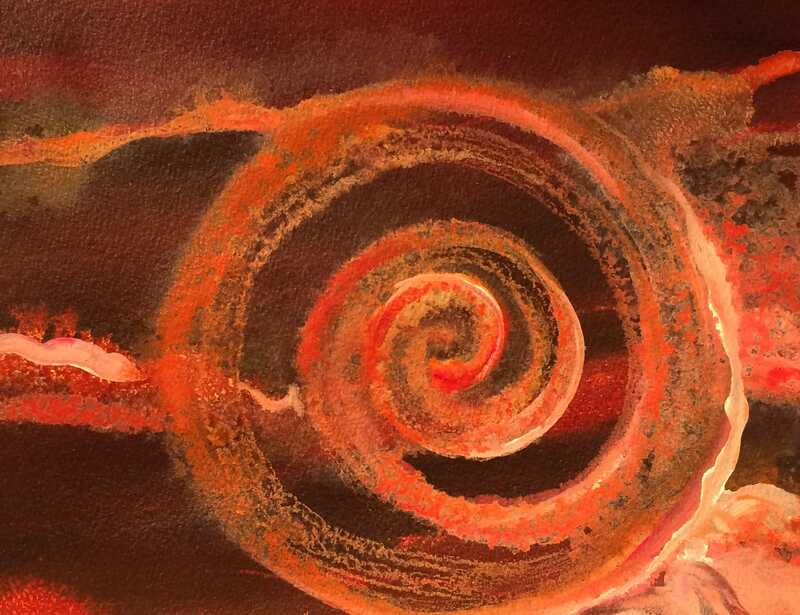 I invite you to join me in experimenting with spirals this week. And stay tuned for new opportunities to connect with others in our creative community via Facebook as the Doodle Challenge evolves.